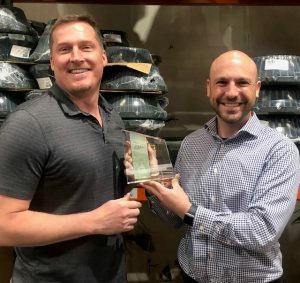 Josam Company recognizes Will and Pierce with the 2018 President’s Award. 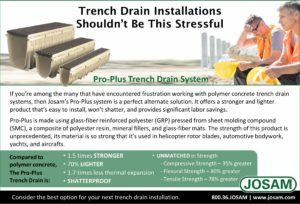 A first time President’s award winner, after years of success with Push-Fit and Trench, in 2018 W&P had a breakthrough year on Josam. Alabama is led by owners Scott Will and Mike Kirchler and Gary Finch handling inside sales for Josam. John Kennedy covers the Gulf Coast from Apalachicola, FL across southern Alabama all the way to the Mississippi/ Louisiana border. Further north you have David Walker and Cody McMurray covering Central Alabama and Terry House covering the Northern part of the state. The W&P team continues to grow with Josam and their other lines by focusing on customer service and unique opportunities to offer something different and better to their customer base. 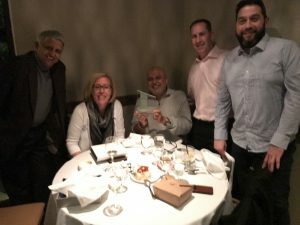 (Left to Right) Varghese George, CEO of Josam International, Paula Bowe, Director of Sales & Marketing of Josam Company, Sonny Kapoor, Mark Schlossenberg, and Milen Topalov of Josam International. 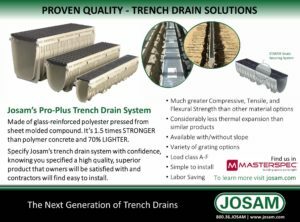 Josam Company recognizes Josam International with the 2018 President’s Award. Led by Varghese George, Josam International is one of two remaining representatives that have been with Josam prior to the acquisition in 1987. If you think for one second your market is tough, just give Varghese a call. Varghese and his team are very familiar with the international market and their long term experience and knowledge allow them to conquer the challenges that they face on a daily basis. Aside from competitiveness, they are faced with major time differences, international politics and logistic dilemmas on a daily basis. The Josam International team do not let any obstacles stand in their way of being a dominant player in the international market. 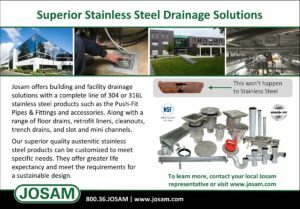 Josam Company will be exhibiting at PROCESS EXPO 2019 in Chicago, IL on October 8th through October 11th. 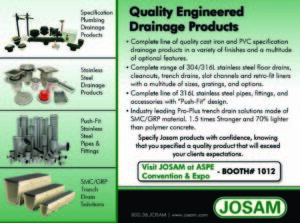 If you plan on attending, please stop by our Booth #521 to learn more about Josam’s stainless steel drainage products. 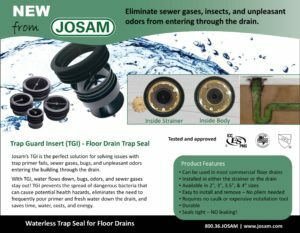 Josam offers a waterless trap seal for floor drains. 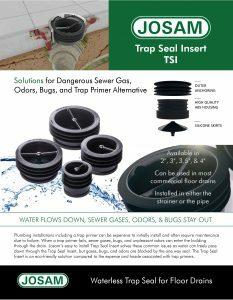 TSI™ can be used in outlet connections of floor drain bodies or the inside of floor drain strainers in commercial facilities such as restaurant kitchens, bars, and food-processing facilities to help seal the drain opening and preventing odors, sewer gases, and insects such as drain and fruit flies from entering up through the floor drain. 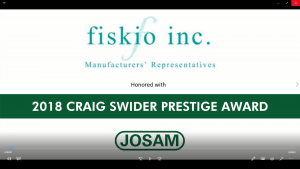 Josam Company recognizes RKR Manufacturer Representatives with the 2018 President’s Award. RKR is defined by their commitment to work as a team and more importantly to realize that success isn’t a single account, but a series of determined steps towards success. The team at RKR view success not as an accident, but a result of determined actions, continued effort, and consistent follow through. 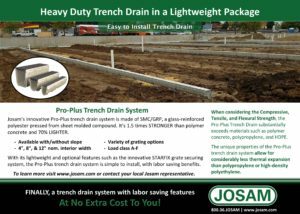 When RKR joined the Josam family in 2010, they looked at commercial drain line as a backbone to a strong commercial rep agency. They were very deliberate about how a drain line can be leveraged to the success of all their lines. Their message to the market is evident in everything they do, “we want to earn your business” and “we are looking for long term partners”. Their passion for success combined with a truly dedicated leadership team and committed sales force is their secret sauce. Congratulations to everyone at RKR! 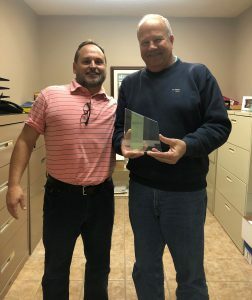 Steve Fiskio and his company are one of the longest standing Josam representatives since the Holloway family acquisition of Josam in 1987. Don’t let Steve’s lean and mean operation fool you! Steve and his key employee John Boudreau are customer service driven and provide top service to their customers. 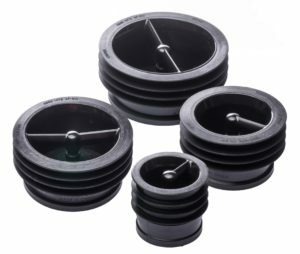 While Fiskio Inc.’s customer base is spread nicely, they do focus on customers that are loyal and are interested in long term relationships based on trust and dependability and of course competitiveness. In addition to their hard working ethic, both Steve and John know how to have a lot of fun while working. Traveling with these guys leaves you with stomach pains from laughing so hard during your car ride from call to call. A well-deserved honor for Steve and John! 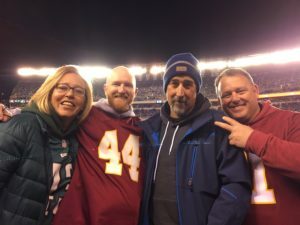 Josam enjoyed a great Eagles win with customers on December 3, 2018 during NFL’s Monday night Eagles vs Redskins game! 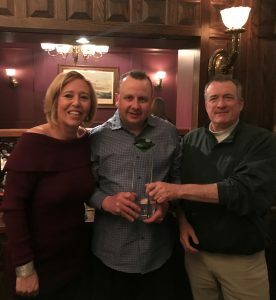 (Pictured: Paula Bowe of Josam Company, Joey Adams of Otto Sales, Bill Carley of Southeastern Mechanical and Mike Hennessy of Ferguson Enterprises). 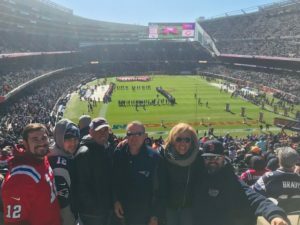 Josam enjoyed a great time hosting our New England customers for a plant tour in Michigan City, IN and the Bears vs Patriots game at Soldier Field in Chicago on October 21, 2018. (Pictured: Paula Bowe of Josam Company, Steve Fiskio of Fiskio Inc., Derek Araujo, Nick Araujo and Derrick Araujo of Araujo Brothers, and Luis Machado of Portland Pipe). 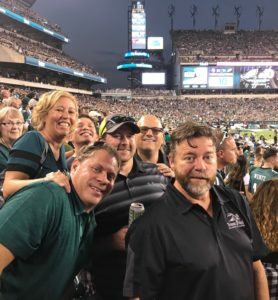 Paula Bowe and Bob Dean of Josam Company had a fun time as they hosted customers at the Eagles vs Vikings game. We felt so bad about last season that we were nice enough to give our customers from Minnesota a win! (Pictured: Paula Bowe/Bob Dean of Josam Company, Phil Gray of Davis Mechanical , John Hakseth of Pioneer Power, Ryan Pageau of Goodin Company and Jed Koep of BMA). 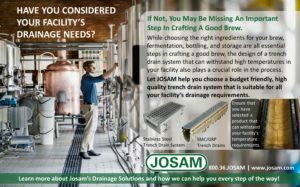 Josam offers quality engineered drainage products for many different applications including Specification Plumbing Drainage Products, Stainless Steel Drainage Products, Push-Fit Stainless Steel Pipes & Fittings, and SMC/GRP Trench Drain Solutions. 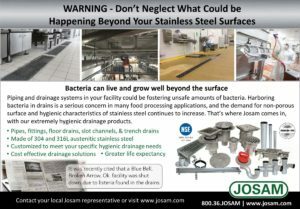 Here you can find Josam’s 2018 print media advertisements to date. 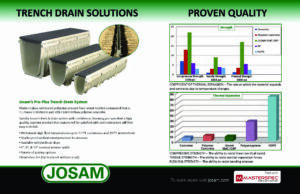 Click the images below to see the different Josam product Ads that have been featured in some of the industry’s top publications.